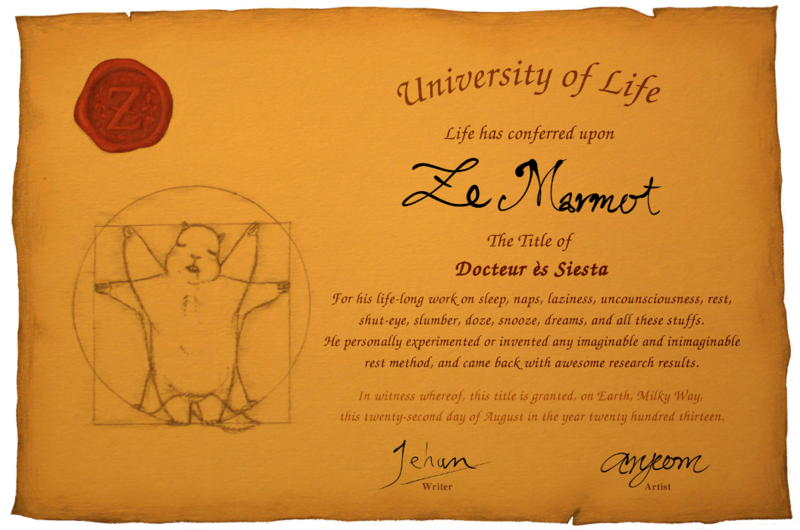 Ze Marmot is like Ze big genius! It has done all your sleep, but more, better, and all that! For his life-long work on sleep, naps, laziness, unconsciousness, rest, shut-eye, slumber, doze, snooze, dreams, and all these stuffs. He personally experimented or invented any imaginable and inimaginable rest method, and came back with awesome research results. In witness whereof, this title is granted, on Earth, Milky Way, this twenty-second day of August in the year twenty hundred thirteen.